One of the new videos produced by Prevention Speaks focuses on Kevin Lucey of Happy Valley Farm near Black Earth, WI. The Innovation Kitchen has processed Kevin and Kate's farm products for both of the two harvests we have been open. Last year Annette and her team made Dilly Beans from their farm. 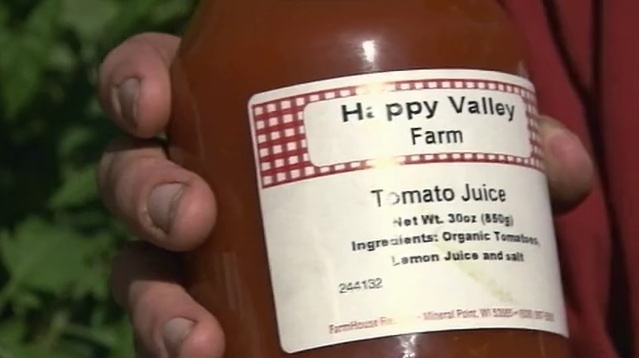 This year we processed about 4,000 pounds of delicious Happy Valley Farm heirloom organic tomatoes into a wonderful juice. This short video focuses on how family farms can utilize an Innovation Kitchen to their benefit. Kevin (from the video): "So this gives an outlet - the Mineral Point kitchen does - for farmers to send them off to another place. Put a little investment in - they have to worry 'Am I going to get my money' - but the way that the banks are paying interest right now, you might as well put it into a jar, rather than into a bank. So, we're banking our money"
Our Innovation Kitchen model can play an important (and delicious) role in helping family farms and appreciative customers find one another year round. In these difficult economic times, farms and food entrepreneurs can invest in themselves rather than just waiting for something to happen. Happy Valley Farm is one of our great new Innovation Kitchen partners leading the way. Thanks Kevin and Kate of Happy Family Farm for your patronage and your good words! Direct link to this Prevention Speaks video, via Vimeo. Prevention Speaks site. Innovation Kitchen story. Check out all three great videos. Innovation in current state of economy is most important for each and every business for their very existence.